In the beginning of 2017 we spent a couple of days in the Austrian village Rauris where we hiked, climbed mountains and skied. Our first hike there went to the 2167 meters high Grubereck mountain which lies north-east of the village. We decided to climb the Grubereck peak because the trail starts in the village and thus we didn’t have to drive to some remote place (the day after New Year’s Eve…) to start hiking. Furthermore, we could see the peak (and conditions up there) from the village which allowed us to assess how technically challenging the climb would be and what equipment we might need. Even though it was January, there was very little snow on the top. Furthermore, the weather was completely sunny and the temperature was above 0 C. Therefore, we decided to leave crampons, ice axes and heavy insulation garments behind in order to save some weight and make the ascent faster. The trail requires decent physical preparedness as it ascends/descends for 1247 meters over the distance of 12.76 kilometers. However, it isn’t technically challenging except maybe on very cold winter days with plenty of snow and icy patches. In such conditions you will need an ice axe and crampons (although actual ice climbing will not be required if you stay on the trail). For those who would like to make this hiking trip a little less physically demanding, it might be interesting to know that you can decrease the distance for approximately 7 kilometers (and ascent/descent for 350 meters) by going up to the Schriefling mountain hut by car. 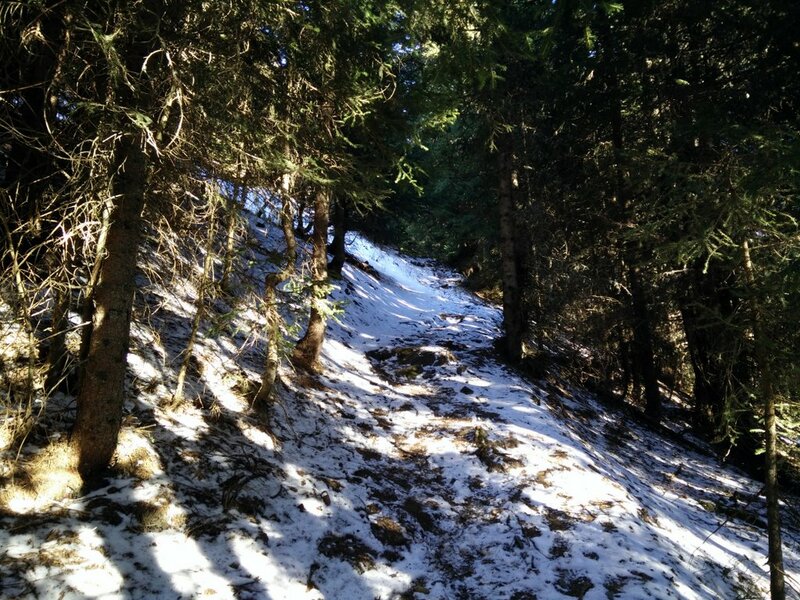 However, in winter the steep road might be covered with snow and ice, so check the road conditions before going. The Grubereck trail starts at the church in Rauris which is a village located approximately 100 kilometers south of Salzburg. If you are coming from Salzburg or Villach, you should drive along the Austrian expressway A10 until you reach the Bischofen/Pongau exit. Get off the expressway there and continue on the 311 towards west until you reach the town of Taxenbach. 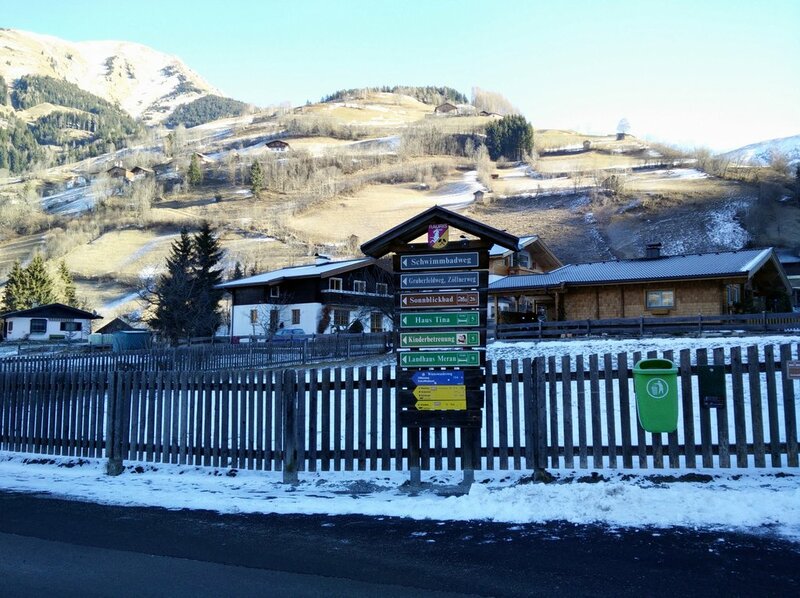 Here you should turn left towards Rauris (L112) and continue until you reach the village. If you are coming from the south-east (Innsbruck, Bolzano) you can also reach the village by driving along the E45 highway until you reach the Jenbach exit. 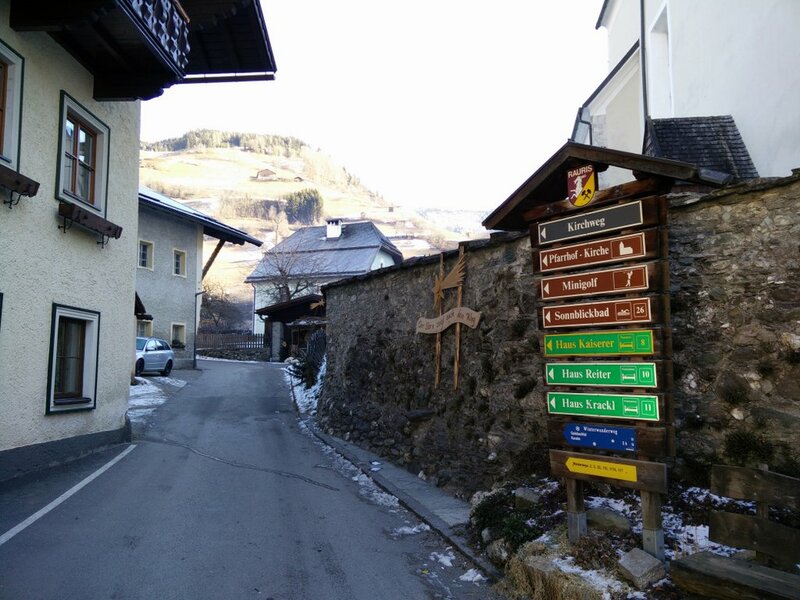 Take the exit and then continue towards south by driving through the towns Fugen and Kaltenbach until you reach the town of Zell am Ziller. Here turn left on the 165 and stay on this road until you reach the town of Taxenbach. In Taxenbach turn right (towards south) and continue on the road until you reach the Rauris village. If you don’t have a car, you can also reach the starting point relatively easy by public transport. You should take the train (for timetables, check out the Austrian railways site) to the train station called Taxenbach Rauris. To and from Salzburg for example there are trains going approximately once per hour (approx. duration = 75min). From the train station you then take bus 640 to Rauris and get off at Rauris Ortsmitte or Rauris Gstatt (check on the map where it suits you best). From the church, you start walking towards north; there is also a directions sign at the church and you should go towards Gaisbachtal – Karalm. Please note that the GPS route attached above doesn’t start at the church but at the guest house where we stayed (approximately 600 meters away from the church). After walking for 150 meters you will reach a crossroad where you should go right and then after walking for only 20 meters or so you should go left towards Grubereck (there is a direction sign again). There the asphalt road starts ascending gently and runs towards north-east. After hiking for a few minutes you will see a public swimming pool on your right and soon after the road will start meandering uphill. Continue on the road until you come to a small chapel in one of the many u-turns (1.7 kilometers away from the church). There you will see a narrow path which runs towards north-east while the road turns towards south. Continue on the path and after hiking for approximately 500 meters you will again reach the asphalt road (the narrow path is a shortcut). Continue on the asphalt road towards north for approximately 1 kilometer until you come to a group of houses. There you will see a direction sign (Grubereck) which will direct you onto a narrow path that runs towards north (here the road turns towards west). At the beginning of the path you will see a wooden gate – which was locked at the time of the hike. We simply climbed over the gate and later figured out that several locals did the same. 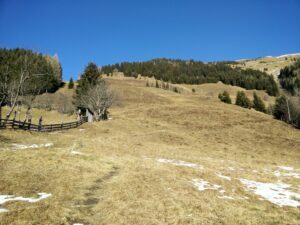 The path then ascends rapidly up the grassy slope towards the Brundlalm mountain hut which lies 1420 meters above the sea level. The hut was closed at the time of our hike but most likely it is operational in summer when there are more people hiking. 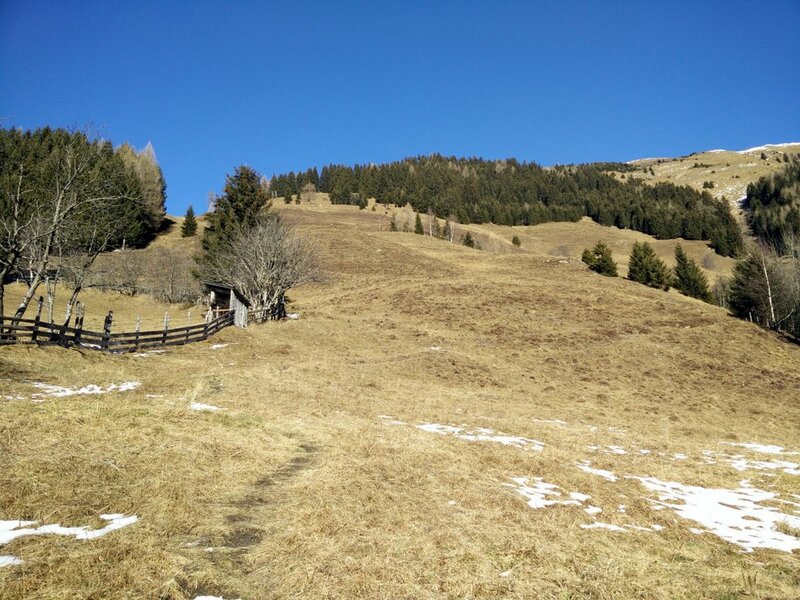 From the Brundlalm mountain hut, continue on the trail which goes towards north-west. The trail soon changes the direction towards north-east and goes into the forest. On this stretch the trail was covered with snow and thus fairly slippery. After traversing half way through the forest you will reach a small clearance where a little hut is located. 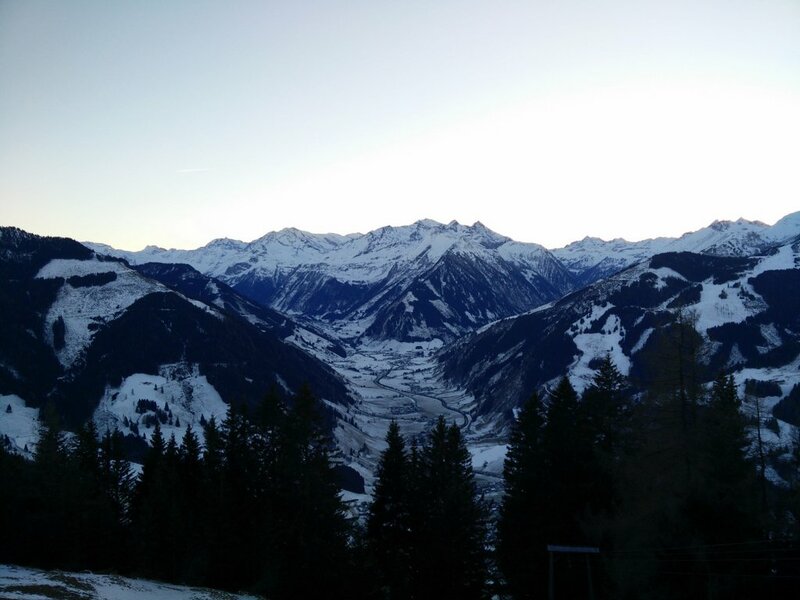 From there you can get a really good view on the Rauris valley and surrounding peaks. 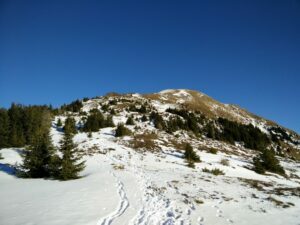 After the forest, the trail starts ascending to the ridge of the Grubereck mountain. From there you only have 1.2 kilometers of hiking (direction east) left before you reach the peak. 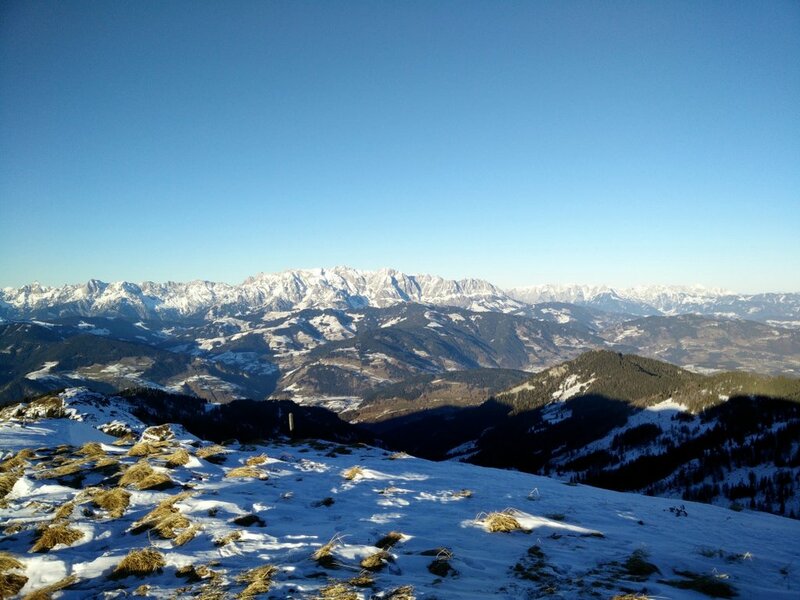 On top you will be rewarded with a great view on the Rauris valley and the numerous peaks surrounding it. 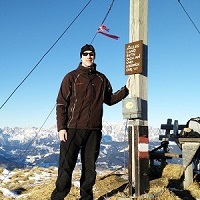 Experienced mountaineers can prolong this trip by also climbing the Sladinkopf (2305 m.a.s.l.) 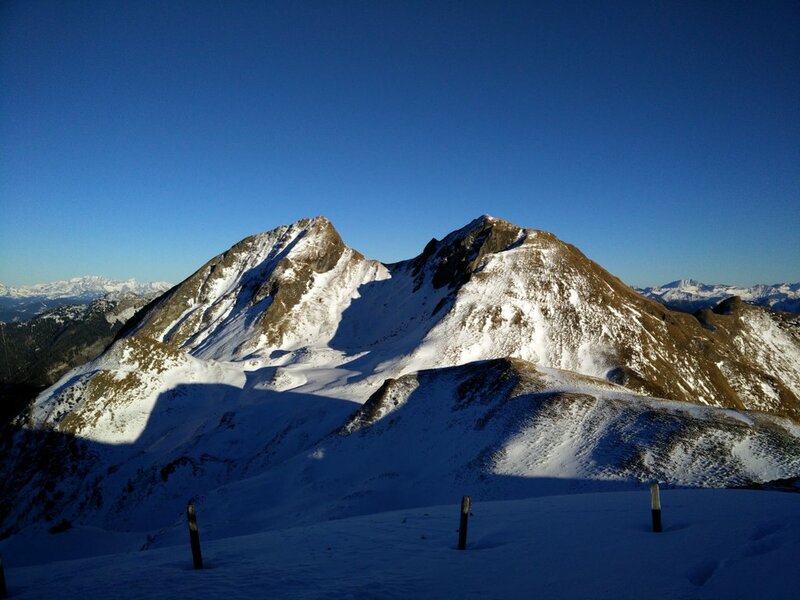 or Bernkogel (2325 m.a.s.l.) which are both located very close to the Grubereck peak. 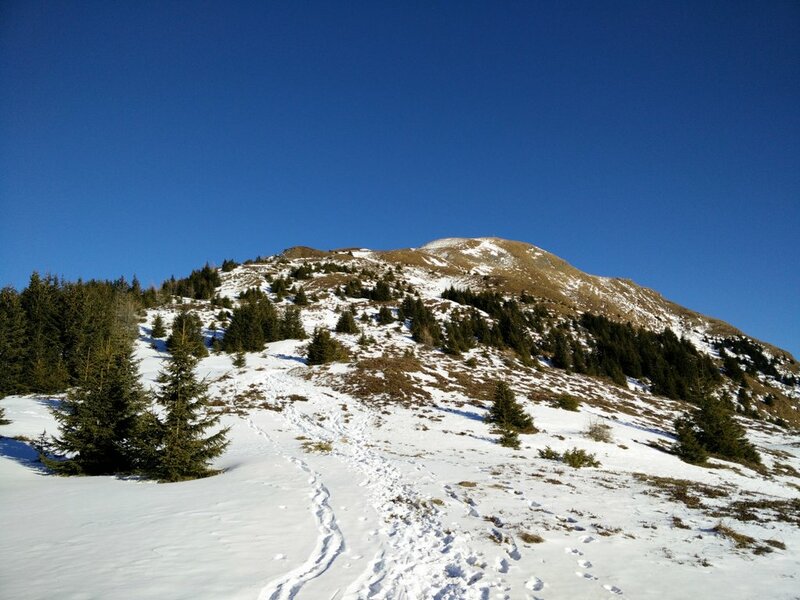 However, the trail to these two peaks is quite technically challenging (probably also in summer). For the way back we used the same path as for the climb except that we didn’t take the shortcut (see the GPS route) as it was already getting dark and was thus easier to walk on the asphalt road. As I anticipated that the hike would be physically quite demanding and the weather was nice, I didn’t bring too many things with me. 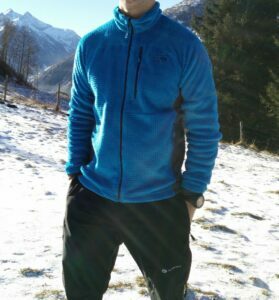 During the hike I was wearing the WoolPro Agena Merino shirt, Mountain Hardwear Monkeyman fleece jacket, softshell pants, Salewa Mountain Trainer Mid hiking boots, Woolx Merino Boxers, Woolx Merino Hat and socks made of Coolmax fibers. In my Osprey Talon backpack I was carrying a softshell jacket, gloves, food, 2 liters of water, warm tea in a thermo bottle and some accessories. Once on top I had to put on my softshell jacket and gloves as it was very windy. On the way back I also used a headlamp as it was already dark when we reached the valley. 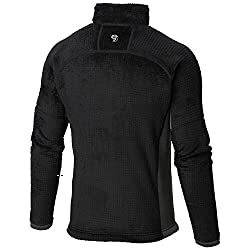 The Mountain Hardwear Monkey Man Grid II fleece jacket offers good warmth while being very light (it weighs merely 357 grams). It is made of Polartec High Loft fleece which has a fluffy structure in order to efficiently trap body-warmed air. I was very satisfied with the jacket on the Grubereck trail as it kept me warm and comfortable throughout the hike. The only downside is its poor odor-control but on the other hand most synthetic garments have this shortcoming. 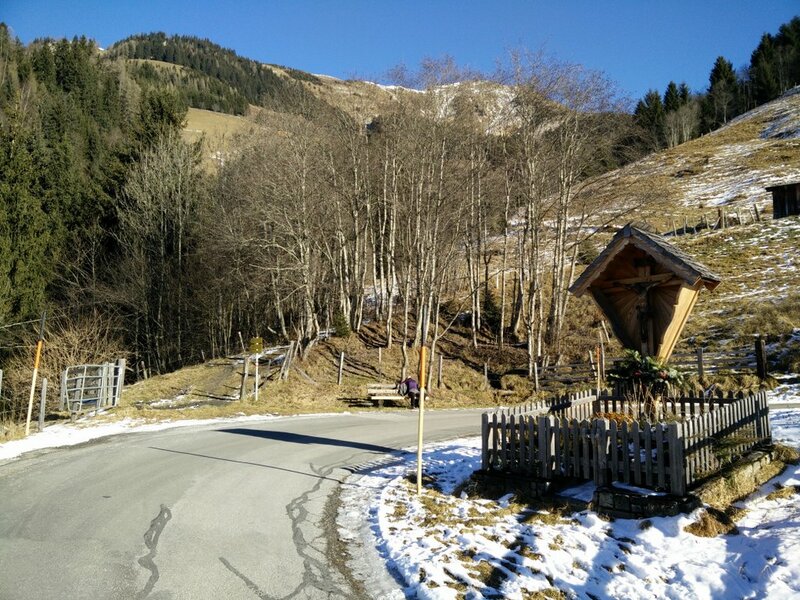 The Grubereck trail is a great option for those who are staying in Rauris and want to do a fairly demanding hiking trip. 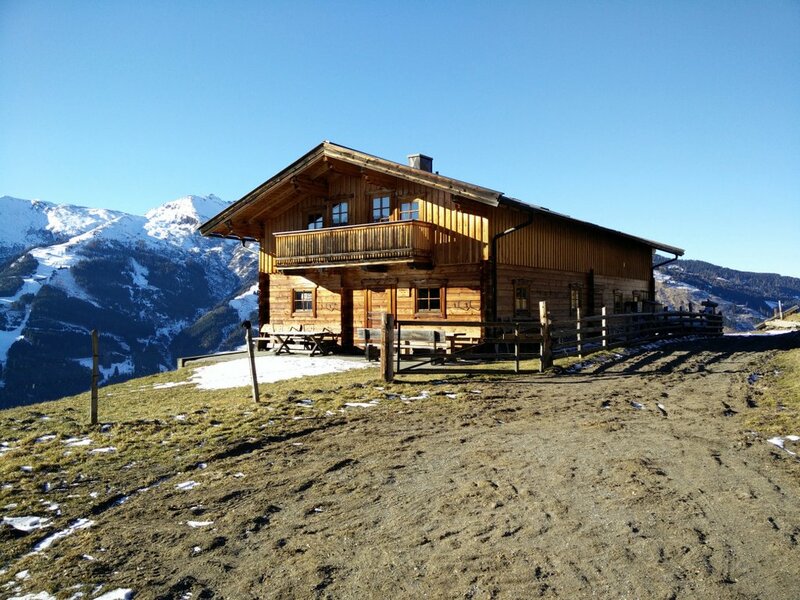 As the trail starts in the center of the village, no driving is required to reach the starting point but as mentioned you can shorten the hike by driving up to the Schriefling mountain hut. The trail is well-marked with several direction signs and painted red and white stripes on rocks, trees etc. 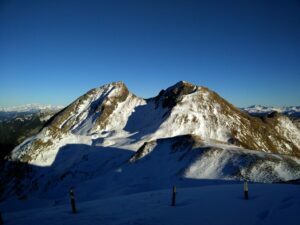 In summer the hike is also suitable for families with kids while in winter it all depends on the conditions – if the temperature is very low it’s very likely that the trail will be covered with frozen snow and thus you will have to use additional equipment such as crampons. We would also advise against doing this hike in bad weather.